Head Guide, Bill Denruyter has been with us for over 9 years, and has been a most valuable asset to our operation. His knowledge of, and passion for hunting and fishing, and his desire to share these experiences with you are just a couple of the reasons he has become the backbone of God’s Country Outfitters. Bill has an uncanny knack for finding game, and personally knows most of the fish in the rivers he guides on, which include the Blackfoot, Missouri, Smith, Clark Fork, Bitterroot(s), and Rock Creek. Bill’s level of expertise, and his concern for you, your safety, success, and enjoyment is really hard to come by, and we are grateful he is a part of our team. I first met Doog about 9 years ago on a South Fork trip that he packed on. I have worked with him on many trips in “The Bob” over the years. I was so impressed with him, his knowledge and abilities, and his willingness to do whatever it takes to accomplish a goal, I just had to get him on our team. He has turned out to be one of the best hunting guides I have ever had to pleasure to work with. I don’t think you can find a better hunting guide anywhere in this great state. This will be Doog’s 7th season with us, and we hope to have him for years to come. Growing up as the son of a state game warden provided the foundation of Shane’s passion for hunting and fishing With a lifetime of experience, and 25 years of professional guiding experience, Shane has guided literally hundreds of hunters on successful hunts. His forte is calling in Bull Elk during the rut, as well as all thru the general rifle season well after most guides have hung up their calls for the season. Shane spends the fishing season guiding fishermen on the Blackfoot, Missouri, Dearborn, Smith, and the South Fork of the Flathead Rivers. Limiting himself to just these rivers enables him to maintain an intimate relationship with these fisheries. 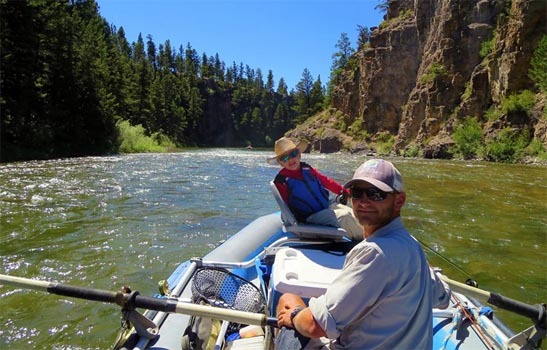 When calls for trips on other rivers come in, he will assign guides with the experience and knowledge of a given river, rather than try to “wing it” himself. Like most outfitters, Shane utilizes the services of Independent Contractor Fishing Guides whom he has fished and worked with, and have proven themselves to be outstanding professionals in their field. While this roster is too long to list here, be assured any guide we assign you is very experienced, and very good at their jobs. Enough cannot be said of the knowledge and level of professionalism they possess. Book a trip now and see for yourself!